Our UK high streets are full of the same day to day restaurants. Most of them belong to some kind of chain such as Bella Pasta, Harvester, Pizza Hut, Five Guys etc. etc. Far from giving choice, it limits choice - is it Italian, a burger or a carvery again? I hear myself say. So it's refreshing to find some restaurants among all these chains that offer something different for lunch. 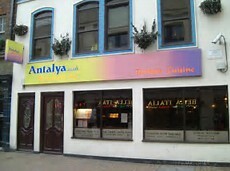 I was in Nottingham's Forman Street recently and opposite a wealth of common eateries, I spotted 'Antalya' - Mediterranean Cuisine it advertised. The menu outside looked exciting and they offered a varied two course lunchtime menu that had my taste buds working overtime.Worth a try, I thought, despite it's emptiness at 12.30 pm, compared with the queues at the Slug and Lettuce opposite, offering two meals for the price of one. The interior was relatively dark and the furnishings a little dated, but I was not about to eat the decor, and the welcome from the young Turkish waitress was generous compared with most opening remarks, like 'Are you alright there,' that you get in most places these days! I was shown to a table for two in the window, alongside the only other customers in there, and I was grateful for the light from outside to help me peruse the extensive menu, including the lunchtime special deal. I was not sure about Turkish wine, so played safe with a bottle of their Chilean Sauvignon Blanc, that arrived and was poured promptly with charm and efficiency by the smiling waitress. 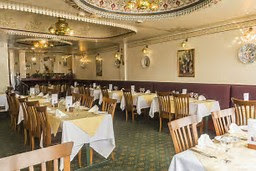 Antalya is primarily a Turkish restaurant that serving authentic Ottoman cuisine and was established 12 years ago in Nottingham by Mehmet Kolcak, who recently opened his first London restaurant in Southampton Row, near to Russell Square tube station. Their menus promote traditional dishes using the very best ingredients. I could't wait to try them! My lunch guest and I opted for two course lunchtime menu, it seemed to offer a wide choice of dishes for starter and main. 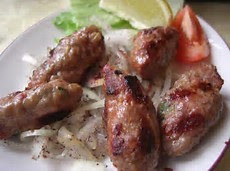 I went with the Falfels for a starter and my accomplice the Mitite Kofte. As we waited for our dishes to be prepared, we spied our fellow customers dishes arriving from the kitchen and they looked good, so our expectations were raised further. Thankfully we were not disappointed, so much so, that we decided to share our starters so we could both benefit from the array of tastes.The lamb meatballs were succulent and spicy, the sauce was heaven sent, while the falfels were beautiful, firm but not overcooked, with the broad bean and chickpea flavour 'zinging' out. The accompanying hummus and side salad was a refreshing addition. The Turkish bread was exceptional. On to our mains and here our experience differed slightly. I chose the Et Sote - diced lamb cooked with tomatoes, peppers and onions served with bulgur rice and my partner opted for the Tavuk Guvec - diced chicken cooked with tomatoes, peppers, onions and garlic, also with rice. The diced chicken was succulent and had clearly been marinated in spices and sauces overtime, but by comparison, I found my lamb chunks quite fatty and tasteless. It was only the excellent roasted vegetables that salvaged the dish for me, along with the fluffy and tasty rice. Clearly, the chicken dish was a great success, as together my guest and I finished every bit. Sadly, I had to return some of my tough lamb chunks to the kitchen. Despite my 'main failure' I enjoyed the tastes and experience of Antalya, and will return again, whether in Nottingham or London. But I must not forget to mention the complimentary fresh fruit that arrived after our mains - a lovely touch of refreshing oranges and melon to clear the palate. The final bill for two course for two, including that bottle of wine and a bottle of sparkling water was £42 plus tip - excellent value for a lunch with a difference. And Mr Kolcak, I think, showed us to the door!